And I don’t just mean fourteen-year-olds addicted to their phones, or adults staying up all hours of the night finishing their projects. I mean everyone, from the current President of the United States tweeting at three in the morning, to the college students who stay up cramming for finals, to the teens who stay up late stressing about their future. Sleep is rare lately. But affected more than any other age group by sleep? United States high school students. Another factor in this is the fact that teenagers are some of the most passionate people. Inciting change, starting protests, banding together, unifying for any cause they can, becoming outraged at things that other people maybe would not. This lands close to home as a high schooler, because of the mass shooting that occured at a Florida high school on February 14th, 2018, less than a year ago. The students of Marjory Stoneman Douglas High School, the Florida high school, incited an entire movement on gun control and school safety, pushing it to international coverage. That very movement became one of the largest the country has seen in a long time, and is still making waves a year later. And teenagers can’t sleep when they’re worrying about being murdered at school. From staring at a phone screen, to cramming for a final, to even simply making time after an incredibly long day of courses, extracurriculars, sports, internships, jobs – students simply don’t get enough sleep. Every student has likely said at least twice that they wished they could just stay home and sleep, or that they got barely any sleep the night before. Personally, I’m writing this article on two hours of sleep. Hawk Headlines journalist, Kylie Leonard, cites her phone as a distraction for sleeping. Hawk Productions writer, Robert Hansen, says his reasoning for getting little to no sleep is due to procrastination on the next day’s school work. Student Government senator, Emma Longo, goes to bed at around 1 in the morning, due to getting home from work at around 10:30 at night, then showering, eating, and doing her class work. Longo believes classes should start at 8:30 in the morning instead of 7:30. Drama Club president, Adam Murray, asked me today how he could do his nine hour shift at work when he’s been awake for thirty hours already. Woodland band member, Austin Woloszyn, says he tries to go to bed at ten, and feels pretty miserable without sleep. “It’s hard to focus, or feel motivated [without sleep],” said Woloszyn. Sleeping is obviously something a human being needs. Without sleep, a human can only live a little above eleven days. There is a reason that it is used as a torture tactic, after all. And in case you’re wondering, I’m also on an energy drink, and a three hour nap I took, so I should be fine, until I crash again in a few hours. So why do high schools make students come in at seven in the morning until two in the afternoon? If students aren’t getting adequate sleep, how do we expect them to participate in sports or other school hosted events such as clubs and honor societies? Students who fall asleep in class are seen as lazy or bored instead of completely exhausted from working hard, and students who fake their way out of a morning gym class are punished and called unfit. Students are working themselves to the brink of exhaustion, and here we are. 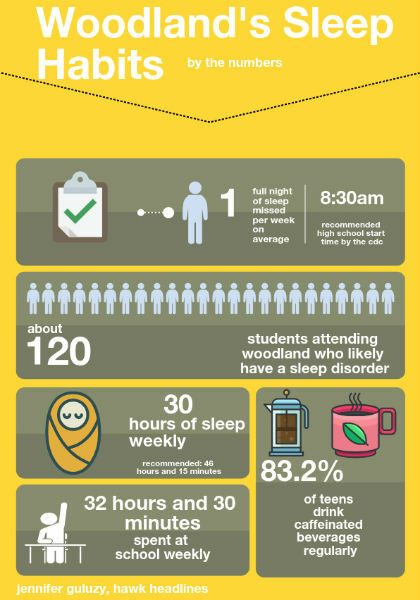 According to the Nationwide Children’s Hospital, teenagers are supposed to get around nine hours of sleep, and with the chaos surrounding the day of a young person, that is commonly forgotten. Last year, Woodland’s administration considered starting the school day fifteen minutes earlier, due to the school buses getting to the middle school late, and in turn making the elementary school buses late. Not only would this cause a portion of the student body to lose more sleep in order to wake up earlier, this new rule would have gone against every single study done about teenagers’ sleeping schedules in the past few years. According to the Centers for Disease Control and Prevention, more than two out of three middle school and high school students don’t get enough sleep, and according to a study done by the Journal of Adolescent Health, 68.9% of high school students reported insufficient sleep. Students were relieved to find that this change would not be made at least during the 2019-2019 academic year. But even with a school start time of 7:30 a.m., students are still staying up until one in the morning, and then waking up at five in the morning, which is a dangerous thing. Students driving on the roads half asleep, missing buses, and coming to school in a zombie form is a sad reality that so many students live through daily. The next generation is a group of bright, talented students who are going to be proprietors of change, doctors, therapists, teachers, athletes, musicians, engineers, and so much more. But the similarity between all of these careers and positions? They all need sleep. 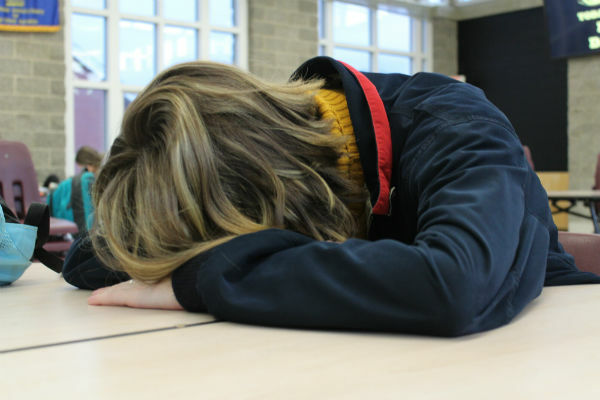 Students in 2019 are struggling to stay awake in class due to much more than you may think. The fact that they aren’t sleeping isn’t merely due to staying up for fun on a phone or electronic device: they are working hard to get into college, to be successful, and to be perfect in an imperfect world. The world will soon be resting on their shoulders, and they’re just trying to prepare themselves for that.